GIA is often held up as the gold standard of diamond grading while other labs are purported to have looser grading standards. However, there is a lack of hard data to support this claim. Prospective head-to-head comparisons are rare due to the cost of sending diamonds to multiple grading labs. When such studies are available they often have small sample sizes (e.g. RapNet study, N=10 diamonds) that limit their ability to draw conclusions about which lab is best. Rather than conduct an expensive prospective study to compare grading labs, we conducted a retrospective observational study of dual-certified diamonds. We searched the inventories from Blue Nile and James Allen and identified a set of diamonds that were certified by both GIA and IGI (N=29). Our analysis of dual-certified diamonds suggests that IGI’s grading standards are comparable to GIA, corroborating the results of the RapNet study. We then conducted a comparative analysis of IGI vs. GIA prices listed on James Allen. For two diamonds of the same carat, color, and clarity grade, an IGI certified diamond is on average 12% cheaper than a GIA certified diamond. Based on the results of the grading and pricing analyses, IGI certified diamonds potentially represent a good value opportunity. We collected GIA certificates for round diamonds listed for sale on Blue Nile (n=143058 diamonds) and James Allen (n=75624 diamonds). We searched the inscription field of each GIA certificate for references to IGI, EGL, or AGSL. For the Blue Nile set, we found 39 dual-certified diamonds (30 IGI, 7 AGSL, 2 EGL USA). For the James Allen set, we found 11 dual-certified diamonds (7 IGI, 1 AGSL, 2 EGL USA). Due to the small number of GIA-AGSL and GIA-EGL USA dual-certified diamonds, we only analyzed the 37 GIA-IGI dual-certified diamonds. IGI grading characteristics were manually collected from IGI’s website for the GIA-IGI dual-certified stones. No data was available for 8 GIA-IGI diamonds, resulting in a sample size of n=29 diamonds, listed below in Table 1. We estimated summary statistics of whether IGI was stricter (i.e. IGI assigned a lower grade than GIA) or looser (i.e. 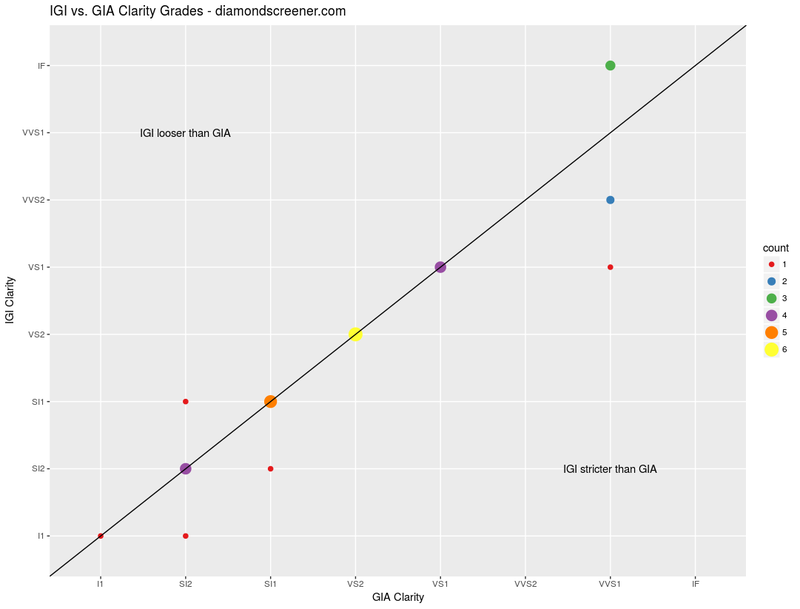 IGI assigned a higher grade than GIA) than GIA for color and clarity. James Allen sells GIA-, AGS-, and IGI-graded diamonds. We collected the prices for excellent cut round diamonds and stratified the prices by diamond color, clarity, and size. Size was stratified in 0.1ct increments, e.g. 0.9-0.99, 1-1.09, 1.1-1.19, etc. Strata having fewer than 5 IGI diamonds were discarded due to small IGI sample size. 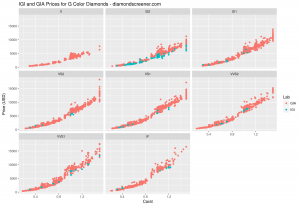 The median prices for IGI and GIA diamonds were calculated for each strata; the median IGI price was divided by the median GIA price to estimate the percent difference. The percent differences were then averaged across all strata to estimate an overall estimate of IGI prices as a percentage of GIA prices. Summary results of the color grade comparison are shown in Table 2. IGI was stricter than GIA in 12 cases (e.g. 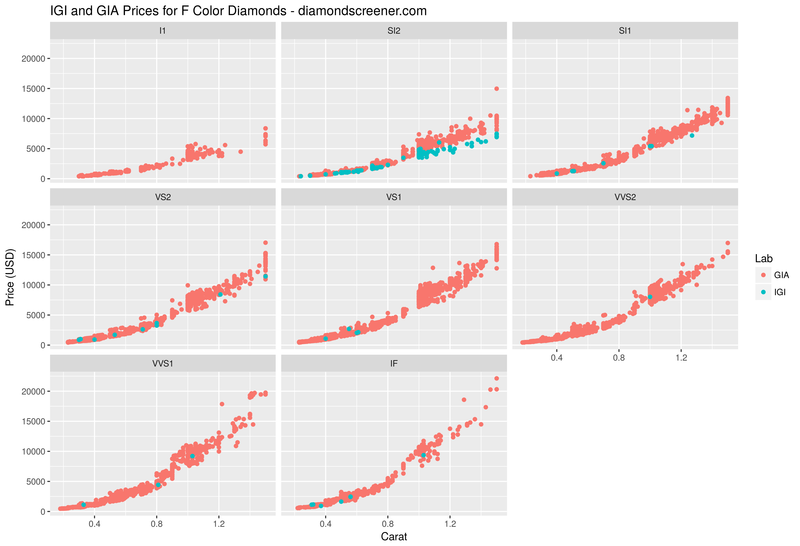 IGI graded a diamond F, while GIA graded it E). IGI was looser in 7 cases (e.g. 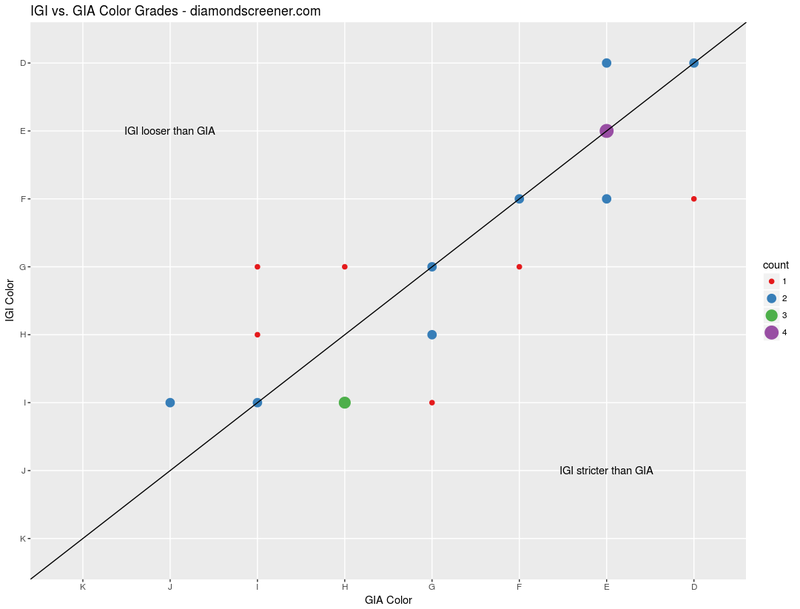 IGI graded a diamond G color, while GIA graded it H color). Both labs assigned the same grade in 10 cases. All pairwise color comparisons are visualized in Figure 1. The line represents cases where IGI and GIA assign the same color grade. Points above the line are cases where IGI was looser. Points below the line are cases where IGI was stricter. IGI and GIA assigned the same color grade in 12 cases. IGI and GIA were within 1 color grade of each other in 14 cases. IGI and GIA were within 2 color grades of each other in 3 cases. Summary results of the clarity grade comparison are shown in Table 3. IGI was stricter than GIA in 5 cases (e.g. IGI graded a diamond VVS2, while GIA graded it VVS1). IGI was looser in 4 cases (e.g. IGI graded a diamond SI1, while GIA graded it SI2). Both labs assigned the same grade in 20 cases. All pairwise clarity comparisons are visualized in Figure 2. The line represents cases where IGI and GIA assign the same clarity grade. Points above the line are cases where IGI was looser. Points below the line are cases where IGI was stricter. IGI and GIA assigned the same color grade in 20 cases. IGI and GIA were within 1 color grade of each other in all but 1 case. The results of the pricing comparison are shown in Table 4. Averaged over all strata, IGI is approximately 12% cheaper than GIA. Individual price curves stratified by color and clarity for IGI and GIA diamonds < 1.5ct are shown in Figure 3. IGI is consistently cheaper than GIA, as seen by the blue dots closer to the bottom of the price curves. James Allen appears to have a smaller selection of IGI diamonds in the D-F color range, except at the SI2 clarity grade. Their selection expands to include more IGI diamonds for all clarities in the G-J color range, as seen by the increased prevalence of blue dots. IGI and GIA are consistent on clarity. They assigned the same clarity grade in 20/29 cases and were within 1 clarity grade of each other in all but 1 case. IGI was stricter in 5 cases and looser in 4 cases, suggesting there wasn’t a bias favoring one lab over another on clarity. There was more variation in color grading. IGI and GIA only agreed on the color grade in 10/29 cases. They were within 1 color grade of each other in all but 3 cases. IGI was stricter in 12 cases and looser in 7 cases, suggesting a slight bias in favor of stricter color grading at IGI. However, we do not have enough data to probe this bias further; it may be an artifact of small sample size or there might be real differences due to other factors such as grading site (e.g. IGI Antwerp vs. IGI Mumbai), changes in grading standards over time (age of IGI certificate), or differences in the grading lamps used by GIA and IGI. 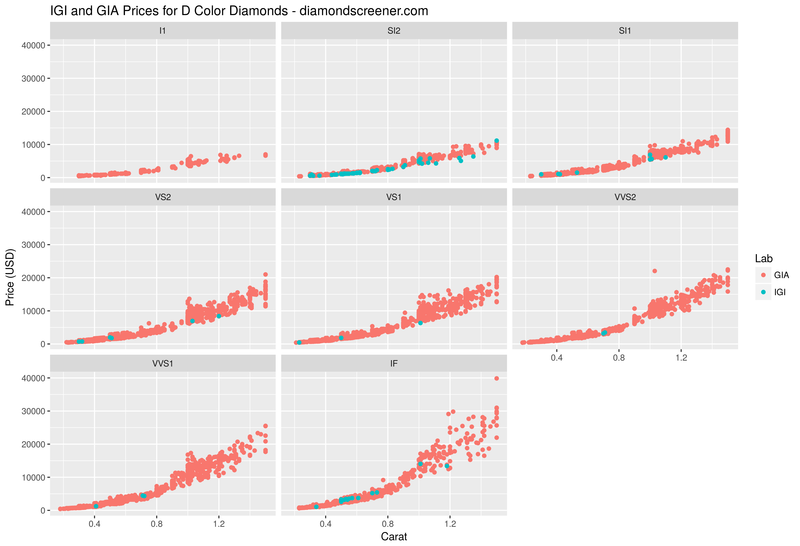 James Allen’s under-representation of higher clarity IGI diamonds in the D-F color range is an interesting result. Based on a study from the International Diamond Exchange, IGI produces more G and H diamonds than the industry average, but 42.7% of their diamonds are still graded in the D-F range. IGI also tends to issue more certificates for higher clarity grades than the industry average. 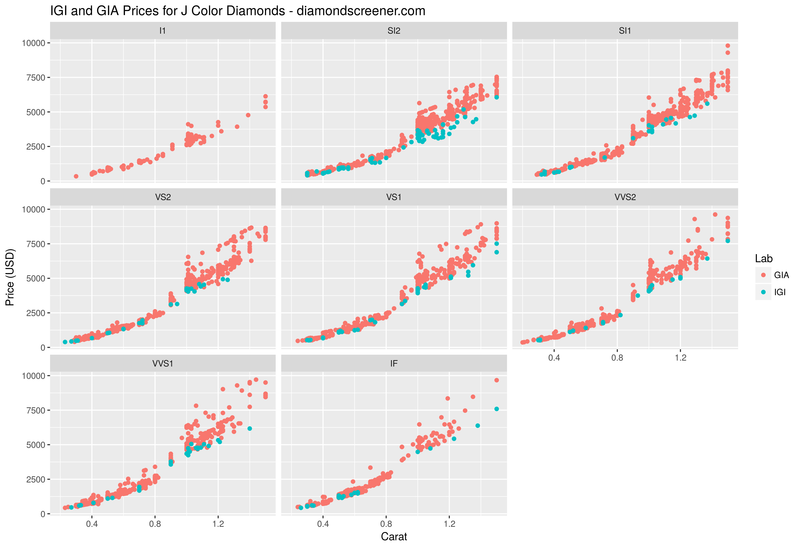 We would need to see the joint bivariate distribution of IGI color and clarity grades from the IDEX study to determine if James Allen’s inventory distribution is representative of all IGI diamonds. This study is subject to a number of limitations. First, it suffers from selection bias. All of these diamonds were first graded by IGI and then graded by GIA. Dealers and jewelers choose the grading lab that will maximize their revenue, so other diamonds that are sent to GIA first and then graded by IGI may be qualitatively different. Second, even though this is the largest publicly available set of dual-certified diamonds, it still has a small sample size of N=29. The small sample size limits the analysis to descriptive statistics. Third, James Allen’s inventory and our set of dual-certified diamonds are separate samples of all IGI diamonds – the grading and pricing results may not be fully generalizable. Finally, there may be other confounding variables that were not considered (e.g. potential changes in grading standards over time). Taking the results at face value, IGI potentially represents a good value opportunity. However, it is important to evaluate each diamond individually to determine if it’s a good deal.